The Williams College Department of Music presents the Williams Percussion Ensemble on Saturday, April 18. There is a pre-concert talk at 7:15 p.m in room 30 of the Bernhard Music Center, and a concert titled Transients at 8 p.m. in Chapin Hall on the Williams campus. These free events are open to the public. The pre-concert talk features composers Eric Nathan and Ryan Ross Smith, visual artist Theresa Chong, and librettist K. Michael Fox. The composers will speak about their works on the evening’s program, and the panel will discuss multi-disciplinary collaboration, the relationship between visual art and music, and new approaches to notation through visual representation. Included in the talk will be multi-media demonstrations of projects exploring these ideas. The concert offers an immersive program featuring all manner of percussion instruments. 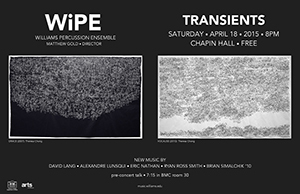 WiPE will explore the musical properties of materials ranging from ringing metals to flowing water. The program features David Lang’s early 1990’s masterpiece Cheating, Lying, Stealing, in which bass clarinet and cello lead the ensemble in an ominous funk groove flanked by ping-ponging brake drum hits. Alexandre Lunsqui’s Entresons.Recreo places the listener in the center of an acoustic environment made up of delicate metals, water, voices, piercing whistles, and gently burbling rhythms. The work is a voyage of discovery through the colors, contours, temperatures, and geography of an imaginary and unfamiliar sonic terrain. Ryan Ross Smith’s opera1 is a new work involving real-time animated notation and video, featuring vocal soloists Claire Leyden ‘16 and Elaina Pullano ‘15. Eric Nathan, Visiting Assistant Professor of Music at Williams, was inspired by the artwork of Theresa Chong for his percussion quartet, Bright Light. Her work presents a myriad of small, lightly-colored pencil dots connected by thin lines bringing to mind solar constellations illuminated in a starry night sky. The concert opens with Brian Simalchik’s (’10) Ringing/Rising, a work for cymbals and triangles that envelops the audience in the rich sonorities of ringing metals, evoking the complex and detailed sounds of the world around us.